I was thrilled when Diann Mills asked me if I would be willing to review her book, Firewall, put out by Tyndale House Publishers. Not a bad gig when you get a complimentary copy. I’ve loved Diann’s writings and her romantic suspenses have caused me to lose sleep more than once in the past. Firewall was no different in that regard. At 400 pages, I read it in less than 24 hours. Taryn is a genious who makes her living designing software that passes through the highest security clearances with the U.S. Government and features many levels of incription to protect against hackers. 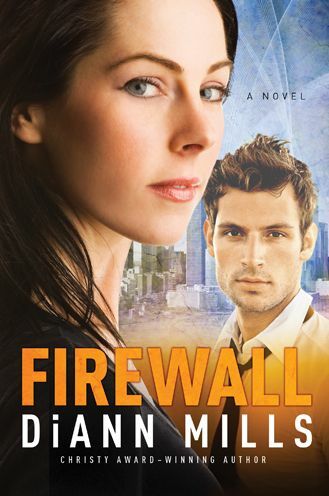 Hence the name of the book, Firewall. Taryn had never really dated but had strong morals. Swept off her feet with a whirlwind romance, she marries and a day later her husband and her are about to embark on their honeymoon when a terrorist bomb almost kills her at the airport. Special Agent Grayson Hall is after whoever bombed the airport and killed countless people. Top of his list is Taryn Young and her supposed husband who has suddenly gone missing. Now is job is to keep Taryn alive while the FBI tries to unravel jsut what is happening and determine if it is a precuror of worse to come. Grayson suspects Russia and a tie between the software controling oil temperatures that Taryn designed. Is she working for the wrong side or can she be trusted. On the run and desperate to prove her innocence, Taryn prays and senses God’s leading to confide in Grayson. As they unravel the growing threats and repeated attempts against them, she seeks to find the threat through the spiderweb of leads that will keep more people from dying. Grayson begins to believe in Taryn’s innocence and has to find a way to use her to help the FBI solve the case while keeping her alive. Not an easy task to do as the introverted software developer has a bit of sass and tendency to take risks when he least expects it. This geek has a bevy of hidden surprises as well that didn’t show up in his reports on her. This story is eerily echoing some of the themes goign on today in the U.S. with tensions with Russia and the threat of terrorist attacks. Throw in complicated technology, a few double crosses, a three year old little girl held hostage and a blooming love and you have a story that is as impossible to put down as it would be for me to even think of designing a firewall. I loved this story and the characters and the depth of complexity Diann weaves in along with the challenges of faith under life or death circumstances.